The tiny beach town of Boqueron is situated close to Downtown Cabo Rojo. It is quite an interesting place, because from Sunday to Thursday, it is a quiet town, tranquil and relaxing. However, once the weekend arrives, the town transforms into one giant party. 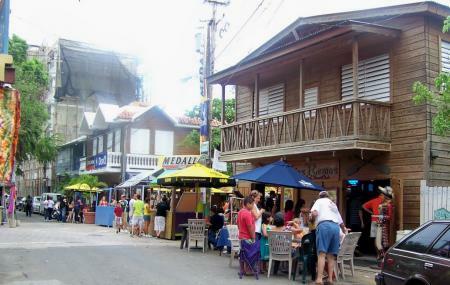 Tourists and locals alike take to the streets to make merry, in one of the many bars, restaurants or nightclubs in Boqueron. The Boqueron Beach is a lovely stretch of sand and sea, which is beautiful and clean. Throughout the week, it is a brilliant place to find some peace of mind, but the beach transforms during the weekend as well. If they’re not in town living it up, the tourists and locals are on the beach having a ball as well. Apart from being the most happening party place in and around Cabo Rojo, Boqueron also has many lovely restaurants with live bands for those looking for a more quiet evening. The beach is always full of vendors, selling different fares like jewellery, oysters, clams and fritters along the road. There are cabins available for rent on Boqueron Beach, which you can book throughout the weekend. When you’re in Cabo Rojo, don’t forget to head down to Boqueron, especially on a weekend. Rest assured, you’ll have a night you won’t forget for a very long time. Bring a sun tent if you can because everyone goes for cover under the palms during the midday heat. Boqueron can get very crowded over the weekend. If you’re looking for a more family oriented, relaxed outing, do so on a weekday. People normally club together Playa Sucia and Cuesta Blanca while planning their visit to Boqueron. People also prefer to end their day with Boqueron.